It seemed the world seemed to pass by the male as he flew, his transparent wings stretching to their full length. It was evident that this was not the males natural habitat. He was an Icewing, thriving in the land of ice and snow, not in the forest but of course who didnt want to try something new. 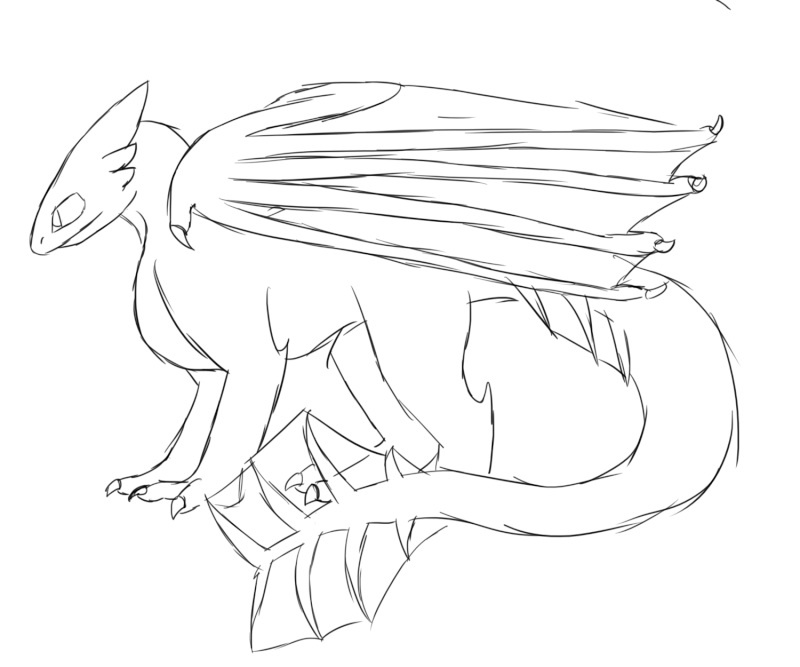 Polaris has changed his dark blue scales to white, making it seem he looked more like a Lightwing. He wanted that effect so he wouldnt be asked questions about why he got here. Casting his dark blue oculars around the terrain he dove, his wings tucking close to him as he though he should attempt flying through the many tree's. It was a idiotic idea and it was just for fun. No harm no foul. The worst he could do was break a part in his wing he and he was sure that wouldnt happen. Pressing his large wings against his body the male began zooming through the tree's at a fast speed. Of course it was not as good as a Skywing as he was larger, built for thriving in the snow and fighting head on. A triumphant roar emit from his maw as he flew past the tree's. He shoulder bumped one and it looked like turbulence on an airplane, the whole body shaking slightly. Regaining his composure before he could hit another tree the male kept going through the trees. Looking back he saw the large indentation of his shoulder on the tree. Letting out a deep melodic laugh he kept going. Turning his head back around a large brown shape came into view but it was too late. He had turned his head too slow. The male tried to stop but it was no use, the only thing he could do was brace for impact. A sound of surprise and pain emit from his maw as he slammed head first into the gargantuan tree. The tree shook but yet didnt fall. A growl rumbled in his chest as the male was stuck there with his curved horns in the center of the tree. Pressing his forclaws against the tree he pulled, a creak coming from the tree as it swayed and danced. Another growl emit from his mouth and he tried again. He was not used to this, running into a tree. No this was not something that would happen to an Icewing. "This is why I dont go into the forest!" he shouted loud into the forest, his deep voice bouncing off the tree's and echoing through the forest. Another angry growl rumbled in his chest as he pushed once more, finally out of the tree's grasp. He let out a surprised sound as he flew backwards and hit the tree behind him, his back slamming hard against the bark. He groaned and plopped onto the ground. "Forests are cruel" he muttered with another groan. Getting up on his feet he began walking through the forest, his head low and his wings tucked tight to his sides. His shoulder throbbed, his back ached and most of all his head pounded with an incoming migraine. A unhappy growl emit from his mouth and echoed through the forest. For once he didnt care. He wanted everyone to hear how angry he was. 'Let them yell at me for being to loud!' he though angrily in his head. It upset the male at how much he had just humiliated himself. Finding a clearing he breathed out a sign of relief. He though the forest would never end. Plopping down on a large boulder he saw a large lake in the middle of the clearing and smiled. Now this was his kind of fun. Jumping into the lake he used his ice breath to freeze a bit of the water, just to make himself more comfortable. Sitting in the water he let out a content sigh. This was the life. He had everything right at this moment except one thing. Shaking his head he sighed again, his azure oculars casting over the terrain again. The water seemed to sooth his aching back and shoulder. Opening his maw he let out a yawn. Man was that a workout. He now appreciated Skywings so much more. Jade was in the middle of the forest, relaxing. When suddenly she heard a loud whoosh above her. Her head snapped up and she followed the noise. Only to see a dragon get his horns stuck in a tree. THAT was funny. Jade fell over laughing. Eventually he got up and walked into a clearing. Jade followed him, still giggling. When she found him, he was sitting in a pool of water. "Trying to (snort) kill trees are we? (snort) Did you think you were an axe? (starts laughing hystericly)"
Relaxing in the water was a nice feeling, especially because it was very cold. The coldness of the water traveled through his body, a familiar feeling because of him living with the Icewings. It was the most peace he had in a while, his hectic life getting in the way. Being a guardian meant he had to protect others and himself. He was very important to the tribe because of his job. In his opinion everyone mattered and everyone and their ranks were important. Even the hatchlings. They were the future of their tribe, learning everything as they went. His peace was interrupted when a annoying sound hit his ears. The male rose from the water, freezing water dripping off his body. The water obviously didnt bother the male. Hearing the female he growled loudly, the growl rumbling through his chest and echoing through the forest. The growl hurt his head, being that his head still hurt from colliding with the tree. "Sorry dirt brain, I didnt know that was any of your concern" he spat angrily. He didnt like Earthwings to begin with. He though of them as fat lazy dragons who didnt have to do anything because their jobs consist of digging tunnels and rolling around in dirt all day. He rolled his eyes in annoyance as she began to laugh. Smirking to himself he blew ice under her, making her prone to slipping. "And no I did not think I was an axe but I could use your thick skull for one" he spat once again, a disgusted look placed on his face. The sound of someone else approaching reached his ears and he turned his head, turning away from the idiot Earthwing. "Hello" the male spoke gruffly, dipping his head in hello before turning back to Jade. He was deeply annoyed by the female and hoped the other male said something to get his mind off her.